We'd be happy to make your next event or party a fantastic success by providing you with simply the best, freshest, tastiest food for your guests to enjoy. Please contact us to find out more about our catering services. Skewered marinated chicken with coconut milk and Thai herbs, served with cucumber relish and peanut sauce. Mixed vegetable, glass noodles, mushroom, stuffing served with sweet orange sauce. Fried fresh soft tofu served with dipping plum sauce and ground peanut. Thai style seasoning ground chicken, minced shrimp, basil leaves roll with the spring roll skin, served with plum sauce. Thai style marinated pork on skewer served with Thai spicy sweet and sour sauce. Skewered shrimps marinated with Thai herbs served with Thai spicy sweet & sour sauce. Crispy fried shrimp with spicy plum sauce. Soft & puffy pastry filled with minced chicken, curry powder, diced potato & onion. Served with cucumber relish. Crabmeat, minced chicken & shrimp served with spicy soy sauce. Minced chicken, peanut, shallot, preserved radish wrapped with soft dumpling. Minced chive stuffed & served with spicy soy sauce. Fried chicken wings served with plum sauce. Rice noodle, meat balls, cubed beef, bean sprout, celery, garlic oil & cilantro in beef broth. Egg noodle in yellow curry, tofu, beansprout, pickle green mustard, red onion and topped with crispy noodle and crispy shallot. Charcoal grilled marinated sliced skirt steak with exotic Thai spicy sauce, served with sticky rice. Marinated pork chop with Thai herb seasoning with exotic Thai spicy sauce, served with sticky rice. Choice of sauce: Garlic Sauce / Ginger Sauce / Chu-Chee* Sauce Served with white rice. Fried jumbo shrimp topped with tamarind chili sauce served with bok choy and white rice. Fried jumbo shrimp with mixed vegetables, mushrooms, topped with garlic sauce. Served and white rice. Sautéed glass noodle, tomato, celery, onion and egg with seasoning soy sauce. Fried rice in Thai style with crab meat, egg, scallion, tomato, onion and carrot served with chili lime juice sauce. The most famous Thai traditional spicy sour soup aromatic with shrimp, mushroom, galangal, lemongrass, cilantro and kaffir lime leaves. This delicious silky coconut milk blend with chicken, mushroom, and flavored with galangal, lemongrass, kaffir lime leaf, onion and cilantro to create a special taste. Chunky beef in clear beef broth exotically scented with fragrant star anise, bean sprout, celery, garlic oil, fresh scallion and cilantro. Clear vegetable broth soup with carrot, baby corn, bok choy, broccoli, string beans, clear vermicelli and fresh soft tofu. Fresh mixed green, lettuce, carrot and tomato served with homemade peanut dressing, topped with crispy wonton skin. Marinated thin-sliced skirt steak with fresh scallion, shallots, and chili lime juice dressing. Served on a bed of mixed greens. Grilled shrimp with thai herbs, fresh scalion, shallot, chili lime juice dressing. Served on a bed of mixed greens. Crispy soft shell crab, pineapple, fresh scallion, red onion topped with chili lime juice dressing. Served on bed of mixed greens. Thai traditional curry. Combination of red curry paste and coconut milk. We also add bamboo shoots, eggplant, bell pepper & fresh basil leaf. Thai folk green curry. Combination with green curry paste and coconut milk with bamboo shoots, eggplant & fresh basil leaf. Aromatic complex panang curry paste and coconut milk, ground peanut & string beans toppd with kaffir lime leaves. Massaman curry combined with cocnut milk, chunky potato, onion, peanuts and carrots. Sautéed with basil leaves, garlic, fresh chili, onion, bell pepper and broccoli. Sautéed with ginger, garlic, celery, onion, mushroom and bok choy. Sautéed with garlic, mixed vegetables, mushrooms, cilantro. Sautéed with mixed vegetables in brown sauce. (Made only steamed tofu, chicken or shrimp) Steamed broccoli topped with peanut sauce. Sautéed rice noodle with egg, bean sprout, scallion and ground peanut. Served with lime wedge & raw bean sprouts. Aromatic fresh basil leaves, chili, onion, bell peppers and broccoli sautéed with flat rice noodle. Sautéed flat rice noodle with sweet dark soy sauce, egg & broccoli. Sautéed rice with egg, onion, tomato, scallion seasoning in Thai style. Aromatic fresh basil leaves, chili, onion, bell peppers and broccoli. Sautéed rice with green curry paste and cocnut milk, bamboo sliced, bell peppers & fresh basil. ❝Thai food shines at this affordable East Village spot, with clean wood tables, white walls, and brown and green striped banquettes. 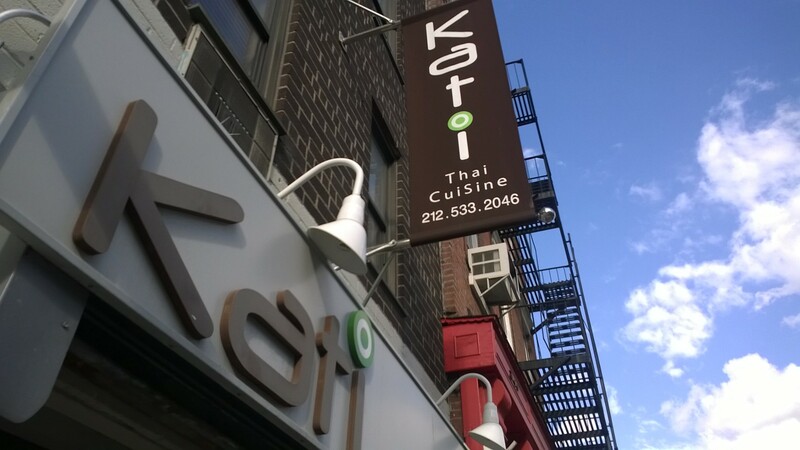 We are a family owned and operated restuarant serving the finest & freshest homestyle Thai food in New York City. 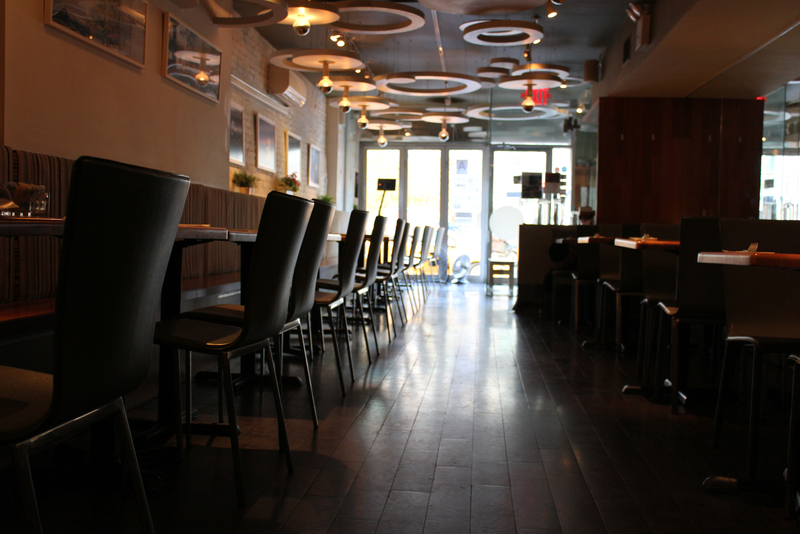 We invite you to celebrate our comforting Thai cuisine and an invigorating dining experience at the edge of NYC's East Village. Since opening in 2009 we've prided ourselves on serving high quality food in a simple, modern & relaxing atmosphere. Please join us for an inexpensive lunch, a pleasant evening meal, a perfect night's takeout, or inquire about having us cater your next event or party. Copyright © 2014 Kati Thai. All Rights Reserved.